If you like cookies and brownies, this low carb chocolate cookie recipe is for you. I’ve never had a cookie quite like them. Adding a drizzle of chocolate makes them even better. I remember baking cookies with my mom in elementary school. I must have been in the third or fourth grade because I remember making the cookies in our Arizona kitchen, which had green and cream striped wall paper in the adjoining dining room and the biggest walk-in pantry I had ever seen. My mom had this really cool mixer/ blender appliance – very similar to the modern Kitchen Aid Artisan mixers except that hers was much lighter in weight and the glass bowl traveled around in a circle verses the orbiting beaters of today’s models. I loved that she let me lick the cookie batter from the beaters and spatula when we were through dropping the cookies onto the baking trays. I think that’s where I developed my love of baking – making cookies with my mother. Soon, I became the official cookie baker and fell in love with cookies! 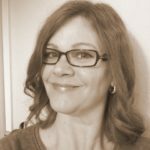 My kids like cookies, too, but usually low carb cookies aren’t anything to write home about; they end up spongy and cakey and very un-cookie-like. I have a simple low carb shortbread cookie recipe that results in crispy cookies perfectly suitable for cut-outs, but cut-out cookies are quite time consuming. I’d rather have a simple recipe that I can make lickity-split. One, that actually looks and tastes like a cookie made from traditional ingredients. These chocolate sesame cookies are the answer to my baking prayers. And the fact that they taste like brownies, doesn’t hurt! 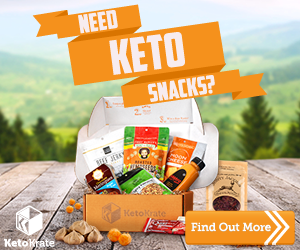 I was actually inspired by this keto cake batter cookie by Tasteaholics which is a refrigerator cookie. For those who don’t know, refrigerator cookies (or ice box cookies) require refrigeration before baking. They are popular for their ease – just slice and bake. I used sesame flour in this recipe but it can also be made with coconut flour, too – both taste great. I really like sesame flour. It is very fine and soft in texture, making it perfect for the first step in a traditional breading procedure. As sesame seeds are a little on the bitter side, it’s best to use this gluten-free and nut-free flour in small amounts, mixing with other low carb flours. If you pay attention to food trends, then you know that sesame and tahini have been featured heavily in dessert recipes this past year. I can see why! I hope you’ll enjoy these cookies as much as my family has. These great Low Carb Chocolate Cookies With Sesame Seeds are 2 net carbs each. These low carb chocolate sesame cookies have a crispy texture and taste just like brownies. 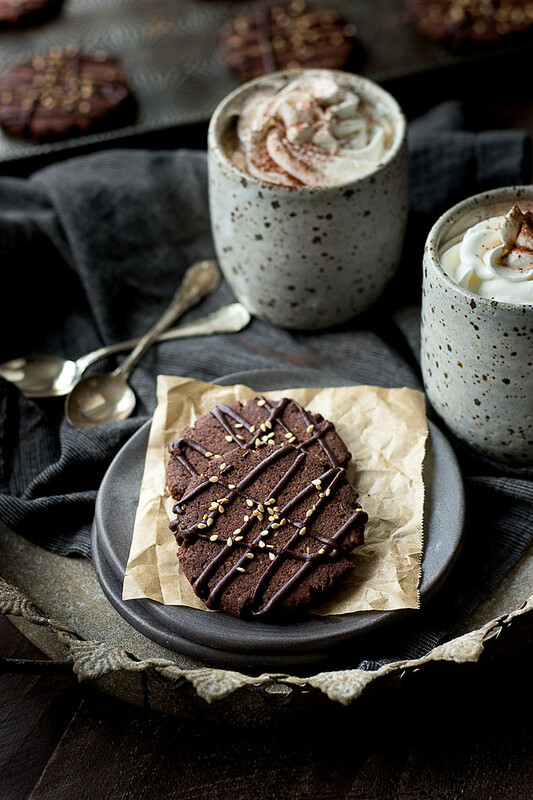 They are good on their own, but taste even better with a drizzle of chocolate! In a medium bowl, cream together the butter and cream cheese with a hand mixer. Add the sweetener and salt, creaming until light and fluffy. Add the egg, vanilla and stevia glycerite, beating again until incorporated. In a small bowl, blend all of the dry ingredients together with a large wire whisk to break up any lumps and to distribute the ingredients evenly. Add the dry ingredients to the medium bowl and mix until a completely incorporated. Scrape the dough onto a piece of plastic wrap or waxed paper, into the rough shape of a log. Fold the waxed paper over the dough and shape into a cylinder. A long skinny cylinder will produce many smaller cookies and a thicker cylinder, less. (Alternately, roll into balls. See directions in the photo description below the recipe.) Refrigerate 6 hours or several days. It can even be frozen until needed. Thaw in the fridge overnight. Bake: Preheat oven to 350 and place the rack into the middle position. Line a baking sheet with parchment. Slice the cookie dough into 16 even cookies and place onto the parchment. They won't spread, so if you want to flatten them out, use a small piece of waxed paper and a flat bottomed glass to do so. Bake 15-20 minutes depending on your oven. Enjoy when completely cool. Chocolate Drizzle: Place the heavy cream, butter and chocolate (chopped or chips) into a microwaveable bowl and heat at 30 second intervals until melted. Blend completely with a small whisk. Scrape the chocolate into a small zip-loc bag and snip off a tiny piece of the corner. 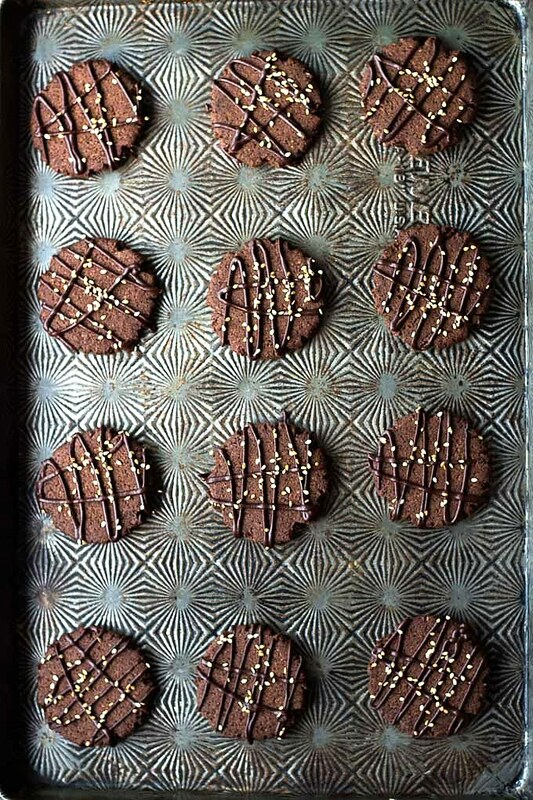 Squeeze the chocolate over the cookies in a pleasing pattern. Sprinkle with sesame seeds. Made these today and were yummy. I used coconut flour, no liquid stevia so I used 1/2 tsp. of powdered stevia. First batch cooked for 15 mnutes and was too much, second batch I cooked at 325 for 12 minutes and were perfect. For the drizzle I used unsweetened chocolate bar with erythritol granulated, I should have used powdered erythritol. Taste was a bit bitter because the granulated erythritol did not blend with chocolate. The chocolate drizzle was an excellent topping but I had half left over. Next time I’ll add chopped pecans, I enjoy crunchy cookies and these are soft. This one is a keeper! Oh my goodness, these are amazing! 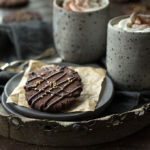 I made these without the drizzle, but they were still outstanding – exactly as described, slightly crispy on the outside and chewy in the middle, with just a hint of that coffee flavour. I baked them for 15 minutes and then switched the oven off and left them in for another 5 minutes, but next time I might just try at 15 minutes, as some of the cookies were ever so slightly overbaked at the edges. Nonetheless, these were a huge hit. I will be making these often, thank you so much. Work is closed today due to no power from the East Coast storm, so I am heading into the kitchen to make this batter up! I’ll be subbing the sesame with coconut flour. Tried sesame in a recipe once, too bitter for me-maybe it was the particular brand. I make the chocolate chip cookies by Tasteaholics and have sightly modified them to suit me. Love them, and that recipe also says refrigerate several hours or overnight. I always leave mine overnight. The cookie dough seems to hold together better. I make them up and freeze them (2 to a plastic snack size bag/6 bags for a dozen inside a larger qt size bag clearly marked) and when I want a little treat, just pull them out. They defrost in minutes. I’m betting my hubby will love these, he has a sweet tooth the size of Texas. 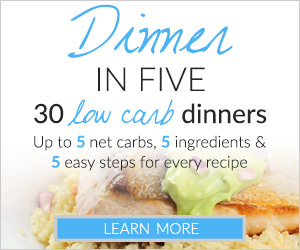 Kim, I have to tell you that these are delish and get 2 thumbs up from hubby and I ! His only comment was he wants some chopped nuts in them next time as they remind him of a brownie. I did slightly reduce the cocoa powder by a teaspoon, next time will try reducing by 1 and 1/2 tsp as I think the brand I use is stronger than most, but the flavor was fine. If there are any left, I will freeze a few and see how they do. I could see these crumbled on or in some ice cream !! Is the refrigeration necessary or can it mix it all and bake them? Hello! 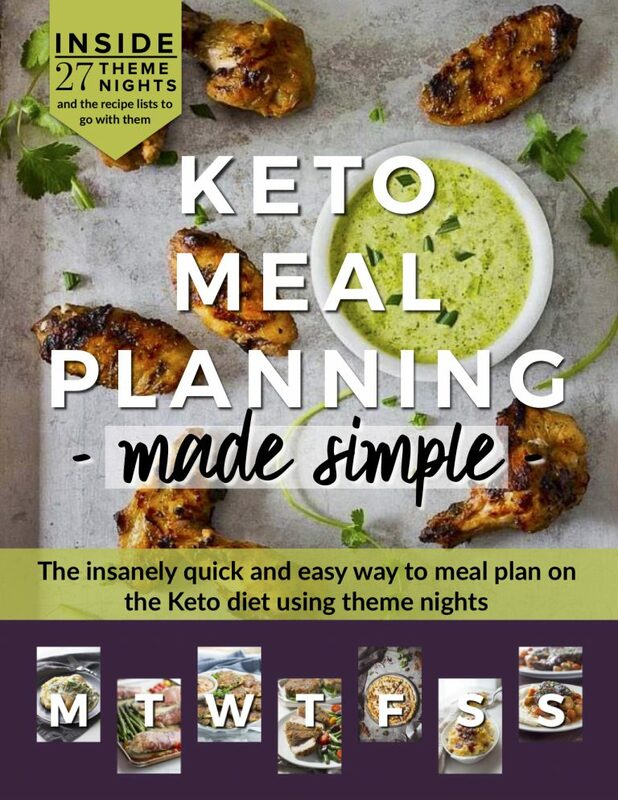 I love your recipes – I’m new to keto living but you certainly make it easy!!! I’m wondering if this recipe will work for cut-out cookies. We had found a chocolate cut-out recipe last year that was wonderful – not too sweet but super good (on Kroger website.) So we’re looking for one this year. Let me know what you can please. Thanks so much for all your hard work! I have made these and they are definitely a keeper!! Sooo good!!! I would have never thought to pair chocolate and sesame together, but it sounds incredible! These cookies don’t look like they are low-carb at all! 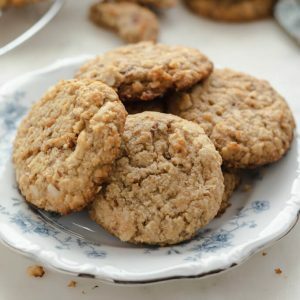 Do you happen to have any cookie recipes that after being cooked are crispy? I really miss the buttery crisp or crunchy cookies kind of like shortbread cookies or sugar cookie cutouts (we called them refrigerator cookies). Thanks so much for sharing and supporting us “newbies”. You mention salt in the instructions but no quantity is listed in ingredients. How much salt??? Another great looking recipe. I can’t wait to try it. looks so good. love chocolate. 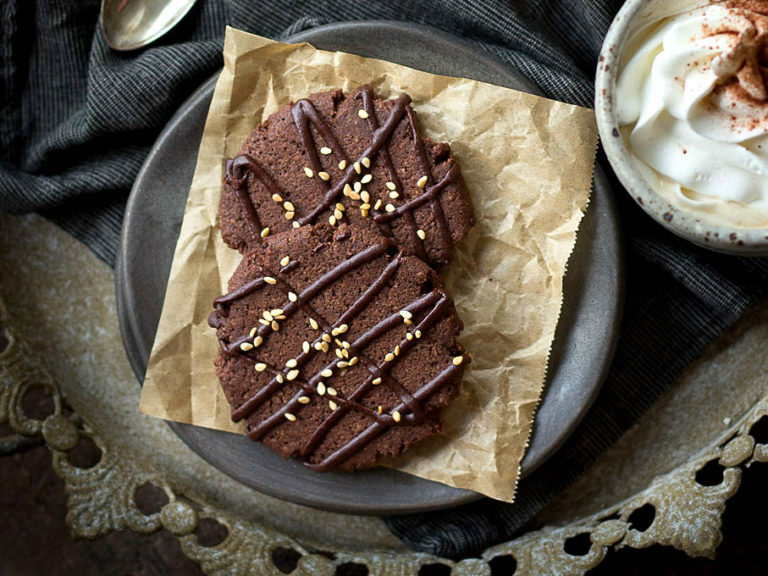 I love chocolate and I love it even more when it’s delivered in the form of a healthy cookie! What a great idea adding the sesame seeds too. Amazing photos! And this recipe looks delicious. These look beautiful! I love the photos and the styling. I have not used sesame flour yet (sesame butter I have used ). I bet is tastes wonderful, as sesame seeds have great flavor! Oh, brownies are my weakness! These cookies look fabulous! Wow, these pictures look like they should be in a foodie magazine. I have mug envy! All of this looks and sounds so absolutely divine I’d like to invite myself over right now. I do love cookies and brownies! I think I’m going to love these cookies too. Love the kitchen of your childhood! You always have to wonder about certain fads…. Your pics turned out beautiful!